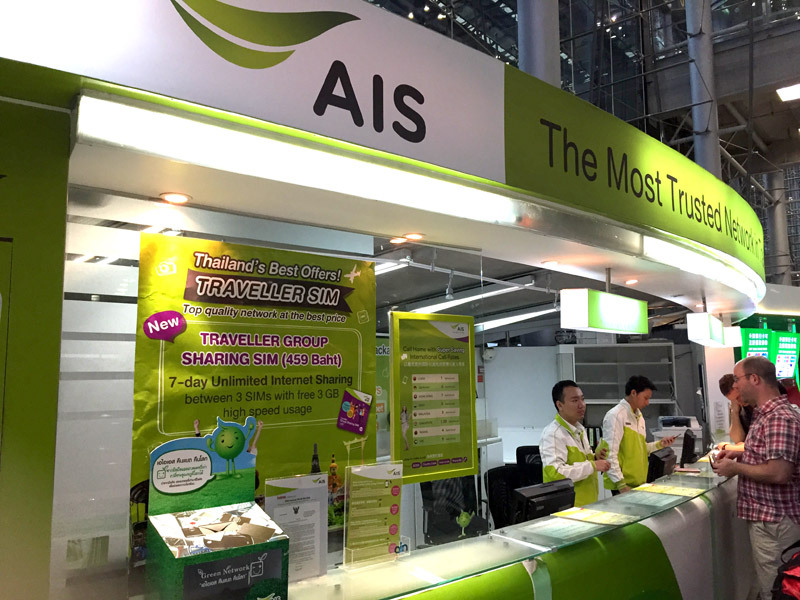 Purchasing an SIM card in Suvarnabhumi Airport of Bangkok, Thailand. Compare the price plan, and choose most suitable SIM for overseas travel more comfortably! When I leave the customs and arrive at the arrival lobby, I buy a SIM card immediately! Bringing a smart phone on trips overseas is needed. When I was a student, there was neither a smartphone nor the Internet. Therefore I did everything without the need of all these gadgets and the internet. It is like a dream that both the internet and the telephone are now usable. You just purchase a SIM card at the airport,if they have a SIM free card for your smartphone and would just have to replace it. Therefore I report the first overseas SIM card purchase today. 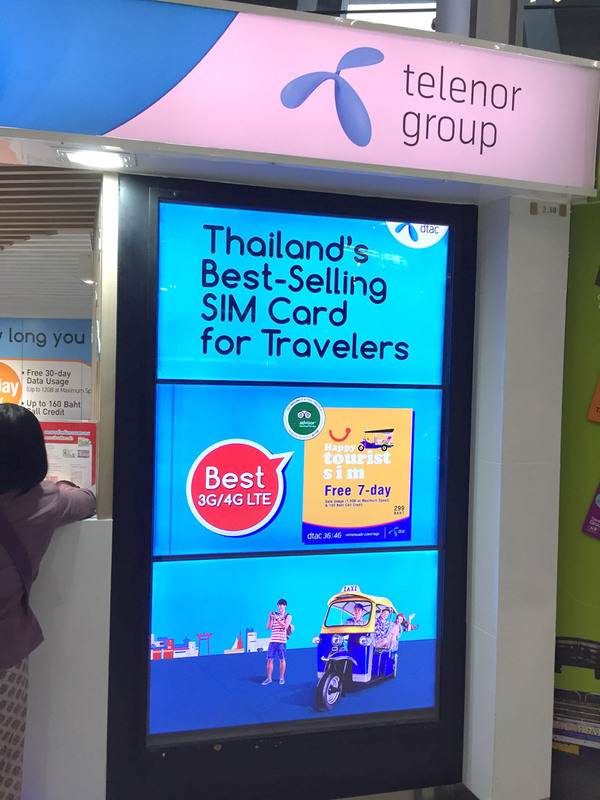 I found two counter of prepaid SIM companies when I appeared in the arrival lobby of the Suvarnabhumi international airport. Because arrival time was 7:30 a.m., I was worried “Is the counter open?” But it was opened properly early in the morning! Dtac company’s blue advertisement signboard is quite noticeable. I decided to purchase “7Days Happy Tourist SIM” 299 baht = $ 8.50 with the call credit (call) for 100 baht at 1.5GB. Because the 4G LTE is usable, I do not seem to have any problem as speed either. There seems to be the 10days/30days plan at the counter of the airport, too. 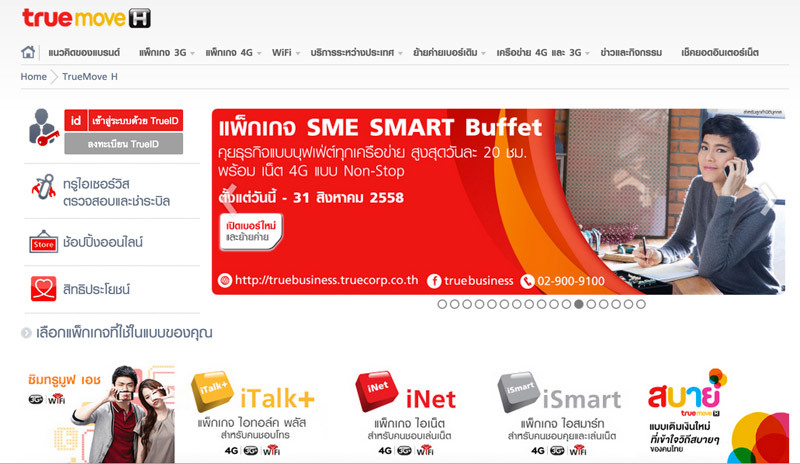 But at the official site, there are 7days plan(4GB/599 THB) and 15days plan(1.5GB/299 THB). You can check the price plan page of the official site when you click follows. 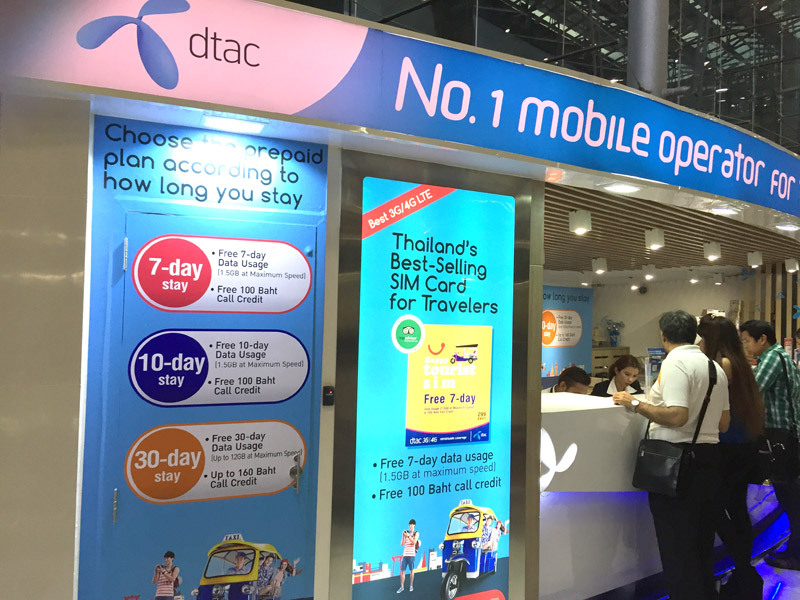 The service contents of AIS and dtac are about the same if you choose the plan for seven days. There is AIS company in the neighbor. You can find greenish-yellow signboards. This is the same plan for 7days. But there was “Traveller Group Sharing SIM” which I shared it in plural people, and was usable. 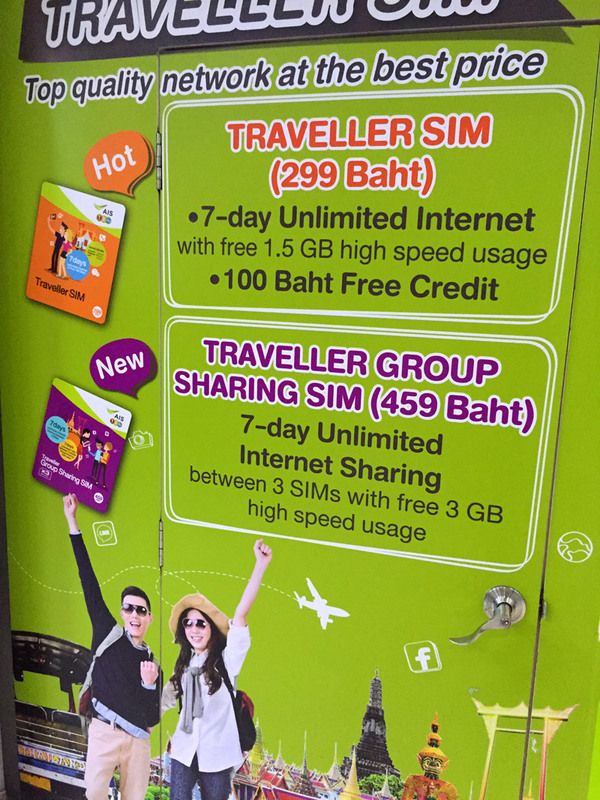 An SIM card is usable to three pieces for 459 baht. The quantity of data transmission is 3GB. When you travel in a family and friends, you should choose this. When I checked it later, I found a carrier called true move. As for Dtac and the AIS, a plan is shortest for seven days, but, in True move, this looks better for a person staying in Bangkok by transit only on 1st because there seems to be the daily plan. About TrueMove, it appeared in this blog in detail. There is a counter if you arrive at the arrival floor, go to the right side. Please look for it! I am a ４-day stay this time in Bangkok. I decided to purchase it in dtac. About the setting, it was not necessary to think about a difficult thing. The person in the counter is able to set all. English that I spoke then was only called “7days”. After going back home, I took this photograph. The seller put the SIM card with adhesive tape which I used in Japan and returned it in this way. Because you should replace it by yourself after go back home again, be careful not to lose it ! A manual written by the words of each country becomes available among them. Not to mention English, Chinese, there was it to a letter like Russian and Middle Eastern letter-like thing, but there was not Japanese for some reason. 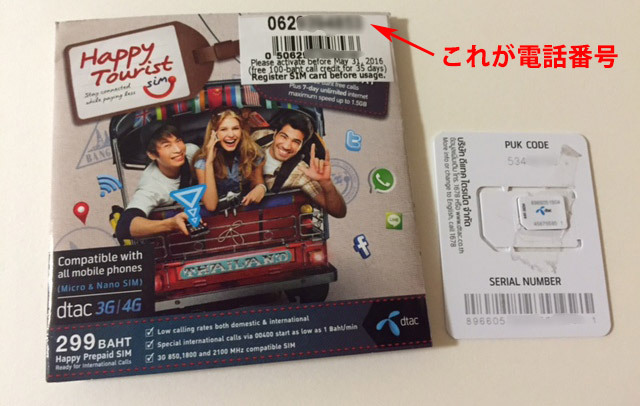 I don’t know how the foreign person who came to Japan for sightseeing purchased an SIM card. 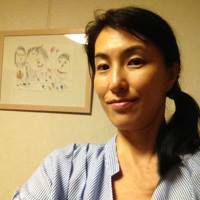 I read a topic in Couch Surfing in several years ago, it is not easy to find wifi for foreigners in Japan. There were few usable places . When an SIM card becomes able to easily use Japan kindness this much, is the person of the visit to Japan tourist not surely saved? Get prepaid SIM in Malaysia.How to Top Up TuneTalk. Go to the Don Muang Airport from Bangkok at cheap price by train and bus. Thai sweets is simple and tasty. If you are little bit hangry,let’s eat. Thai sweets is simple and tasty. If you are little bit hangry,let's eat. Issiki Beach is recommended for family in this summer. Young tau foo (醸豆腐) is free to choose both the ingredient materials and the noodles for preference. My jobs are Web design and direction about web sites. Make your website by using WordPress. My vague purpose is that “ I want to live abroad someday ”. I like doing a trip here and there.